When it comes to the curb appeal of your home, your garage doors can have a tremendous impact. Don’t let a dull design drag you down! Instead of limiting yourself to the standard offerings of your average garage door manufacturer, come to Dynamic Garage Door for custom garage doors in Los Angeles CA. 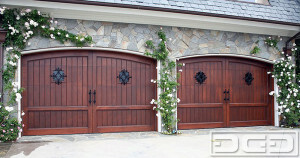 Carriage style doors are one of the most popular types of custom garage doors in Los Angeles CA we make. By going the custom route, you can ensure your carriage style doors harmonize perfectly with your home’s architectural style and match all your trims and finishes. At Dynamic Garage Door, we can create charming carriage style doors to whatever level of authenticity you require. We make both traditional swing-open doors and more convenient modern roll-up doors. Just because your home has a minimalistic exterior design doesn’t mean you can’t have high design in your garage doors. Whether you want to continue the sleek look with metal or glass doors, or warm it up a bit with wood, we can help you create custom garage doors in Los Angeles CA that will look so perfect you’ll think they are original to the house. At Dynamic Garage Door, we don’t just craft custom garage doors in Los Angeles CA. We also help you care for your doors. The first and perhaps most important step is professional installation of your new doors. We also offer a comprehensive maintenance and repair program designed to keep your doors and opener systems in top working condition and ensure you enjoy your custom garage doors for many, many years to come. If you would like to learn more about designing your dream garage doors with Dynamic Garage Door, Call855-343-3667.